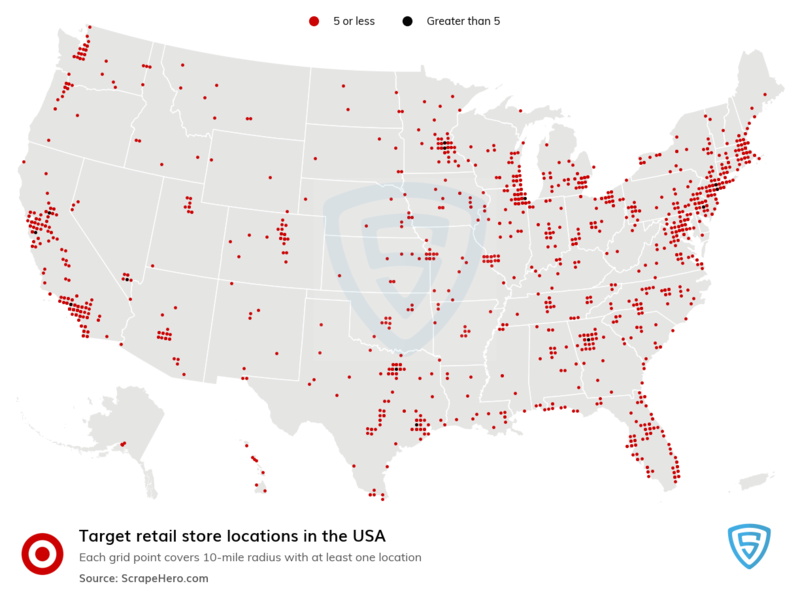 Target has 1844 stores in the USA. Over the past 20 months, Target has added 31 new stores. You can Download all locations of Target and other retailers from our Data Store. Target TGT 82.8 +0.7 +0.8% stores are located across 1,249 cities, with California having the highest count of 278 stores. The graph below shows the top 20 states with the largest number of target stores. 19.03% of Target stores are located in California while Texas comes second with 10.13%, followed by Florida with 8.35%. Although California may have the highest number of stores, the city with the highest number of stores is Chicago, IL followed by Houston, TX and San Antonio, CA. Target stores are open for extended hours with 21% of stores (391 stores) having their opening and closing times from 8 AM to 10 PM. Most Target stores are open every day with only five stores closed on Sundays.